Running Wilde: "One Forward Step"
“One Forward Step,” tonight’s Running Wilde was a disappointment on a number of levels. First, it’s the first weak episode penned by writing duo Franklin Hardy and Shane Kosakowski, who are arguably responsible for one of the show’s funniest subplots. (As stupid as it may be theoretically, the abortive seduction of Andy Richter’s character in “The Junior Affair” is just too funny, especially for the car wash scene.) Second, it’s the first episode since late November, when the news broke that the show was being canceled, to really remind us that Running Wilde has yet to hit its stride. Both of the previous two episodes of the show, especially “It’s a Trade Off,” have been the strongest of the series yet. But then again, that’s not saying much, considering how much dead air the last nine episodes have featured. Still, I maintain it’s harder to pin down why Running Wilde isn’t the sum of its considerable parts than it might initially seem. Its ensemble cast is always the best thing about the show, especially the surprisingly versatile Keri Russell. That’s realistically the brightest side of “One Forward Step,” an episode that didn’t flatter anyone but Russell’s comic timing, as when Steve’s step-mom D.D. (Drea de Matteo) asks Emmy, “‘Climb down?’ Are you in a tree?” and Russell delivers an excellent pregnant pause before bluffing her way through her obligatory reply, “No! I just live in a tall building.” Russell is good enough to make the stupid “dam app” joke work, even if I saw it coming from a mile off. This makes me think that the show’s not a middling but promising mess because the writers choke on the show’s central smarmy-oblivious-rich-man vs. savvy-poor-woman conflict. 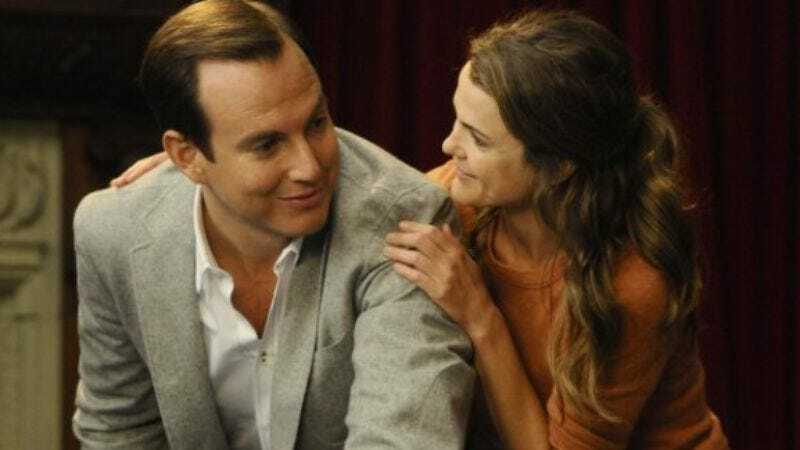 Will Arnett may not have had any really good lines that played to his strengths as the aforementioned oblivious rich man in “One Forward Step,” but in general, he doesn’t need to. He, Russell, and the rest of the generally top-notch cast can usually coast on fumes and look good while delivering the show’s most strained, groan-worthy gags. (I nominate “I’d like to put her in a burqa and imagine what she looks like” as this week’s worst one-liner.) So even if characters aren’t that strong, they aren’t really the worst of the show’s problems. But if there is one major thing that makes unflattering comparisons to Arrested Development inevitable, it’s the way that Running Wilde’s writers just don’t seem to want to do anything with the show’s formulaic sitcom premise. “One Forward Step” is the worst example of how the writers more often than not just waste time spinning their wheels. Most of the episode is spent setting up the intricacies of a plot that never satisfactorily pays off, so to speak. Steve decides to donate to Emmy’s new charity, a fund dedicated to raising money for causes in general: It’s the “cause of causes,” as Steve says. But Emmy’s charity is a front, one of her many attempts at confronting Steve with his callow and superficial interests, and she only winds up attracting the attention of D.D., who insists that Steve’s dad has cut him off just for being charitable. (Wacky, no? Rich people hating charity? Oh, the hilarity.) Andy shows up and sets up a loan shark operation to get money for Emmy’s fake cause. Eventually, everyone’s borrowing money from Andy and nobody has any to give, not even Fa’ad, who winds up looking to score with D.D. so he can make back the money he just spent on buying a ridiculously expensive bike from Steve. The mechanics of setting up and resolving the episode’s monumentally labored plot totally eclipse the episode’s middling jokes. And because the show’s ultimately just a hipper-than-thou sitcom and nowhere near as durable as Arrested Development, events eventually reset and everyone winds up back where they were when the episode started. Then again, the fact that the episode is called “One Forward Step” though the show’s status quo remains perfectly intact by episode’s end confirms that the writers know what they’re doing. Too bad that being self-aware in this case didn’t necessarily make Running Wilde funnier. Nothing seemed to go right in “One Forward Step,” not even a done deal like when Steve compares the maids that do his laundry to the Fraggles on Fraggle Rock. This is especially surprising, as it seems like that joke can’t fail to be funny. Running gags are the show’s strong suit—this is a Mitchell Hurwitz show, after all—and who doesn’t love Fraggle Rock? And yet the joke just never comes together. The jokes in “One Forward Step” generally just felt sloppier, less energetic, and more stillborn. Every chance that Hardy and Kosakowski have to go farther and do something really outlandish or uniquely surreal is squandered. Fa’ad’s cache of pipe dream inventions, like the chest toupees and falafel vending machines, were cute, but they just felt like throwaway sight gags that weren’t even necessarily the best ideas that the writers had when they were spitballing ideas for that scene. They only really look good within the context of the rest of the episode: In other words, they’re only really funny because so little of the rest of the episode was. Then again, I keep watching Running Wilde and will continue to watch until its bitter, premature end because it’s got a good deal of promise. It’s got a lot of some promise, as the last five minutes of “It’s a Trade Off” proved, but only when the cast get to really cut loose and break away from the show’s mostly stale plots. Many of the show’s best sequences boil down to comic timing and delivery: Pouts, yelling, and histrionic body language really sell the show. But still, if “One Forward Step” is any indication, letting the show crash and burn is probably the best thing for everyone involved. Show co-creators Arnett, Hurwitz, and Jim Vallely can probably whip up something new and equally funny in a flash. I just really hope that when they do eventually go back to the drawing board together they look back at “One Forward Step” and remember how stiff and pointless their brain child can feel when nobody but the cast is really trying.